I made a deal with Tom last night. If he would take the kids to the school at 5:30 a.m. to catch the bus for the math meet, I would cook him a hot breakfast. He said that he had planned to take the kids anyway, and I had planned to cook a hot breakfast anyway, so it all worked out. I woke up at 6:45 in a perfectly Primal way with the sunlight streaming into our bedroom window. 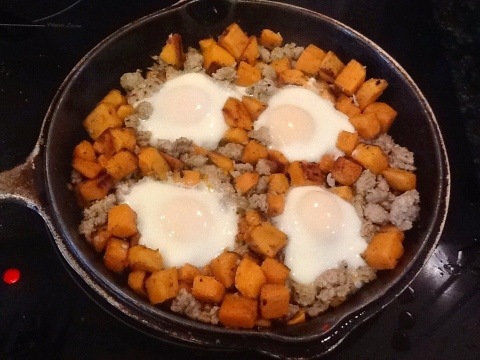 I’ve had my eye on this recipe for a skillet breakfast for a couple weeks now. I actually meant to make it last week, but I screwed up and baked all the sweet potatoes. Duh! I modified the recipe slightly to make it lower in calories since I’m not currently exercising and Tom is trying to drop a few more pounds. 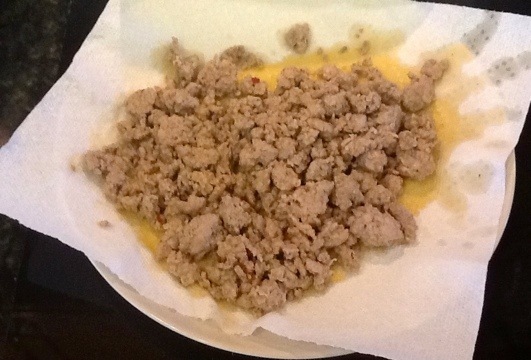 Cook breakfast sausage over medium heat until browned. With a slotted spoon or spatula, transfer to a plate lined with a paper towel. 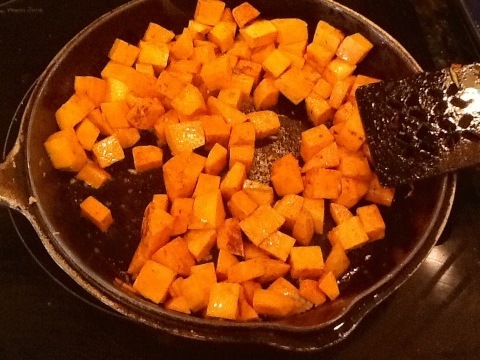 Leave some grease in the pan for cooking the sweet potato. Place another paper towel on top of the sausage and set aside. 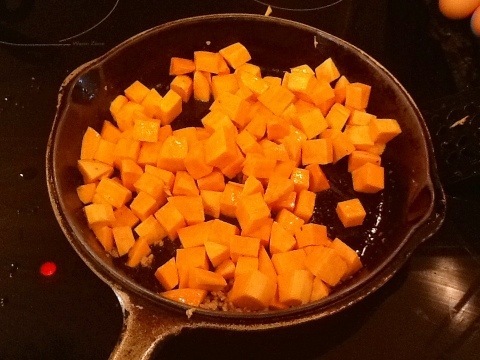 Add diced sweet potato to the pan. I seasoned the potatoes with salt, freshly ground pepper and chili powder. I think curry powder would taste good, too, but I didn’t think about it at the time. 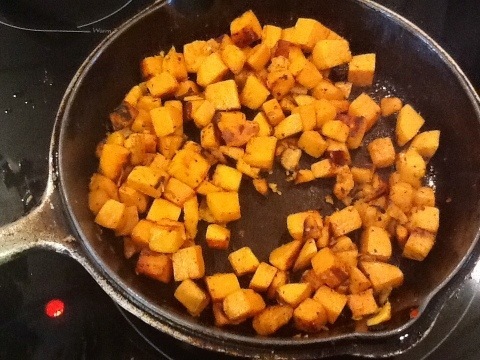 Stir frequently so the potatoes don’t stick to the bottom of the pan. I steamed the potatoes to get them to cook through. I steamed them twice for 3 min at a time. 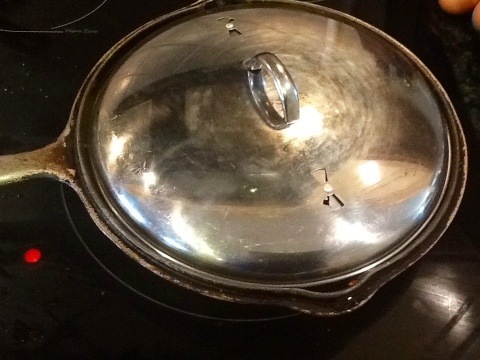 This also allowed the potatoes to brown and slightly carmelize. 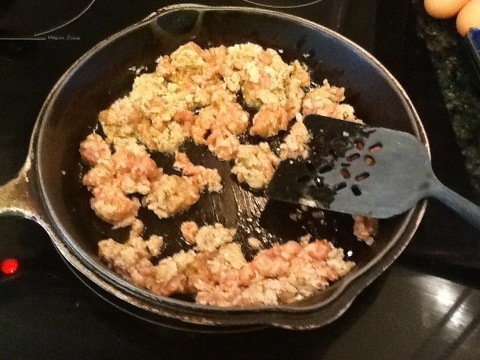 Add the sausage back to the pan and make 4 wells for the eggs with a spoon. Crack the eggs into the wells. Cover and cook until whites look solid, 3-5 min. I added the shredded cheese to 2 of the servings for Tom. 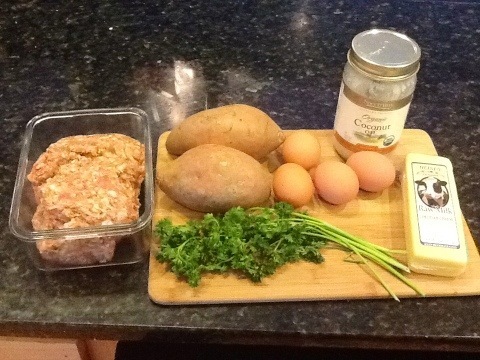 I topped mine with fresh chopped parsley. I also sprinkled mine with tabasco sauce. Isn’t the tabasco bottle so cute and mini? Tom said that the recipe had sounded good to him but not great. Once he started eating it he was raving about it. There’s something about the flavor of the tender sweet potatoes offset by the slightly spicy sausage that is more than the sum of its parts. Just like the movie Logan’s Run: the acting isn’t great (with the major exception of Jenny Agutter), the special effects are marginal and even the directing is barely adequate. But there is something compelling about the movie. I think that Jenny Agutter draws the viewer in, and as she is Logan’s guide she also serves as the viewer’s guide to this 70’s vision of the future. The same goes for this breakfast. All of the ingredients are quite ordinary, but the combination works together better than you would think. I have always liked skillet breakfasts with white potatoes, but this is even better. Next time I might throw in some baby spinach as well. This is a great way to start your day right with a serving of vegetables! I’m definitely trying this recipe. Like it all, but the roasted sweet potatoes stand out to me. 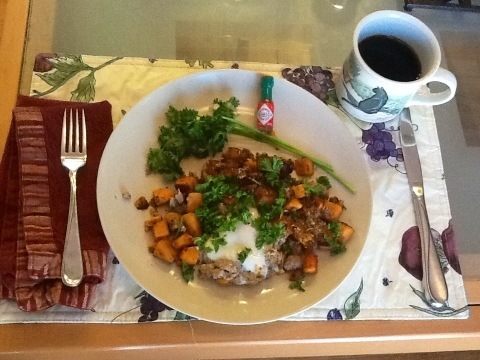 When we were in Madison, we had a breakfast scramble with the diced sweet potatoes, and, as you can see, it has stayed in my mind! You won’t be disappointed with this recipe! I’m looking forward to having the leftovers!